Microsoft PowerPoint is a presentation program by Microsoft which is part of the Microsoft Office suite for Microsoft Windows operating system. In other to allow anyone who likes to open and watch Microsoft PowerPoint presentations (created in PowerPoint 97 though PowerPoint 2010) in all formats on their computer without the Microsoft PowerPoint installation, Microsoft has released a new PowerPoint 2010 viewer for viewing PowerPoint presentation in full-fidelity. According to Microsoft, the new PowerPoint viewer is expected to present all the new transitions, video and effects exactly like in PowerPoint 2010. Able to view, copy and print presentations. Supports opening password-protected Microsoft PowerPoint presentations. Supports most of the presentation formats such as ppt, .pptm, .pot, .potx, .potm, .pps, .pptx, .ppsx and .ppsm. Intuitive User friendly interface with navigation buttons for next slides, previous slides, print, copy, help, full screen slide and end show functions. 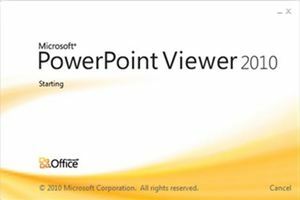 PowerPoint 2010 viewer works well in most of the Microsoft Operating Systems such as Windows 7, Windows Server 2003 R2 (32-Bit x86), Windows Server 2003 R2 x64 editions, Windows Server 2008 (SP2), Windows Vista (SP1), Windows Vista (SP2) and Windows XP (SP3).